It has a pale face with dark rings around the eyes, a yellow beak and brown eyes. It is the only owl which has brown eyes; all others have yellow eyes. The head is round and lacks ear tufts, a distinction from the Short-eared Owl. The upper parts are mottled gray-brown. The underparts are light with markings; the chest is barred horizontally while the belly is streaked lengthwise. The legs and feet are covered in feathers up to the talons. 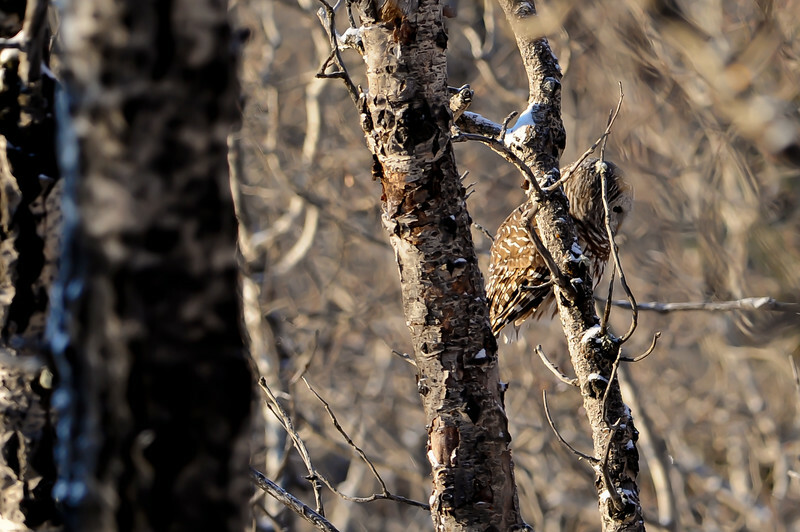 How on earth did you ever see this owl out in the woods. I couldn't even find it in the photo! Once I did find it in the photo it was obvious, but it took me about a minute to find it in the first photo.